When at all possible I prefer to give non-electronic gifts. I think there is a little piece of magic inside receiving something that's handmade as well. Here is a DIY project that anyone can make and will provide lots of entertainment, no matter the age. Here's what you'll need Chalk Board Spray paint, a ruler, masking tape and a piece of lumber. I used a 1x10 (the board I used measured out to be 9 1/4 across making the measurements easy). I chose to make a few different styles by staining my first piece. Then measure out your lumber and apply your masking tape. I would also recommend taping the edges so you can avoid bleeding from the spray paint onto the edges. 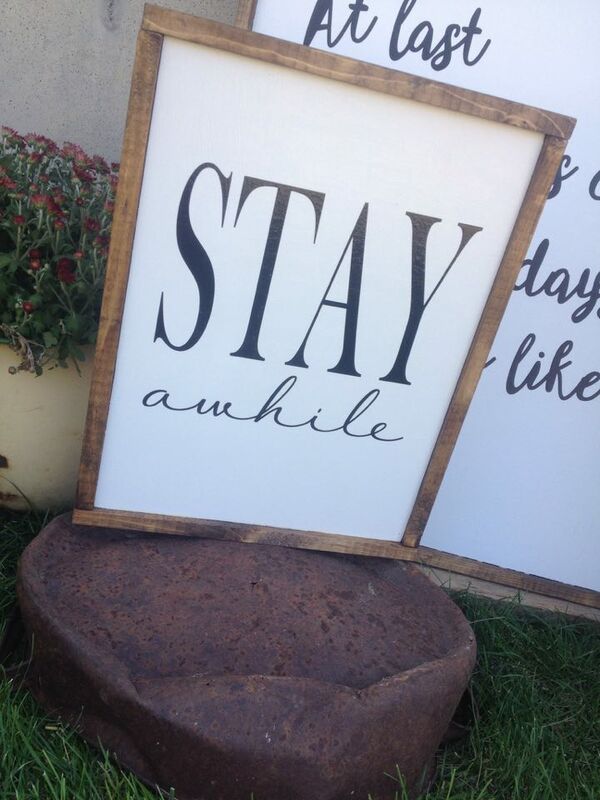 You will then head outside and spray paint your piece of wood. I applied two coats of Chalk Board spray paint allowing it to dry for 20 min before I applied a second layer. 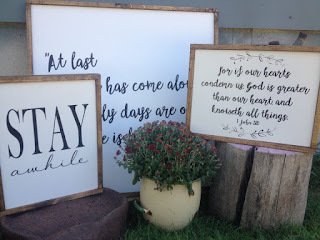 For a little more fun you can paint the backside with your chalk board paint as well. 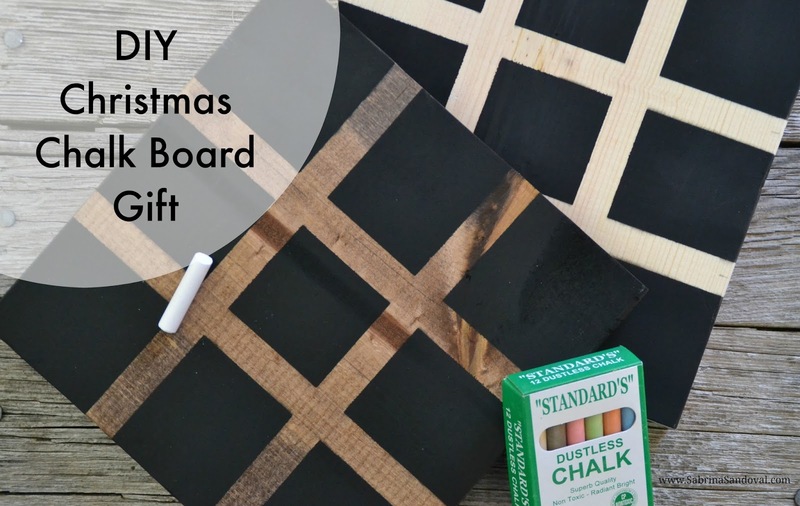 Partner your board with some chalk and you have a perfect handmade gift. The Christmas season is here you guys! Our family is so excited for all things winter. In a world where we are striving for the best Black Friday deal or the most bang for our buck on Cyber Monday, I want to encourage you to change your mindset this year and celebrate the new year without a mountain of Credit Card debt hanging over your head. 1. 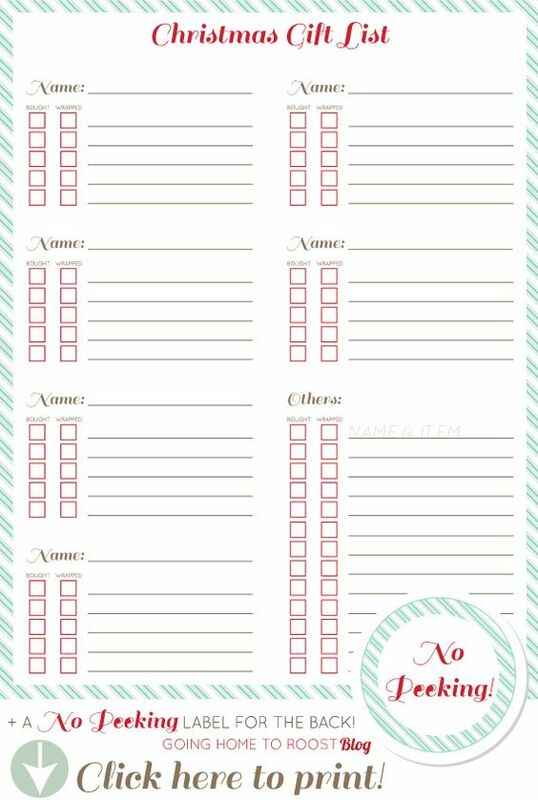 Create a List! It's incredibly helpful to know who your buying for. This helps you to keep from overspending and impulse buying not knowing if you have everyone. 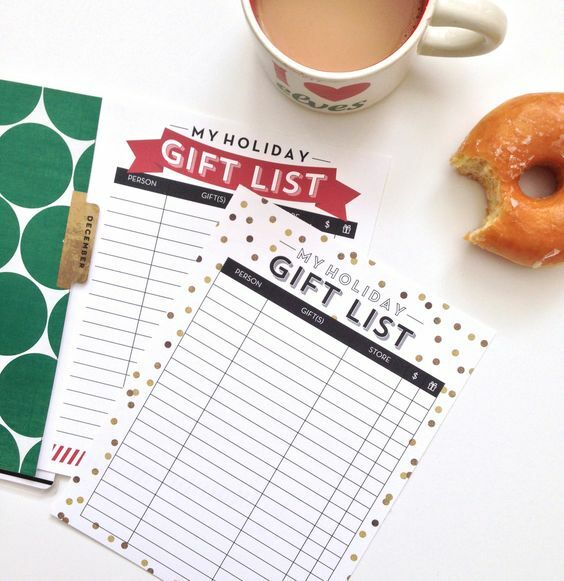 Below are a few printable Christmas gift lists I adore. 2. Create a Holiday Gift Budget! 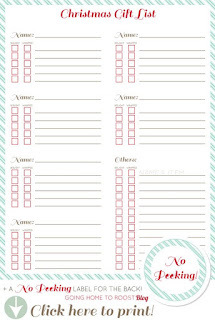 I found this Printable over at CreatingMarysHome.com and love the layout. Be sure to hop over and print it out and USE it! 3. Resist Temptation! This might be one of the hardest tips! Around the holidays there is a surplus of flyers that have very enticing deals, commercials with all of the newest gadgets and at the checkout lines you'll find "specials" that are strategically placed there for the shoppers to grab. Stick to your list and avoid those little extras that all add up to hundreds of dollars on stuff we don't need. 4. Pay for gifts with Cash! Before you head out to do your Christmas shopping stop by the bank and grab some cash. With your budget in hand you'll be able to pull out the right amount of cash that will enable you to buy for those on your gift list without putting it on a credit card. 5. If you don't have cash on hand then it's time to add to your budget! Check out my series on way's to add to your Christmas budget. Simple steps daily will help you to have the money in hand to avoid overspending. May your Christmas season be full of Wellness and Prosperity! We're a family of 6. 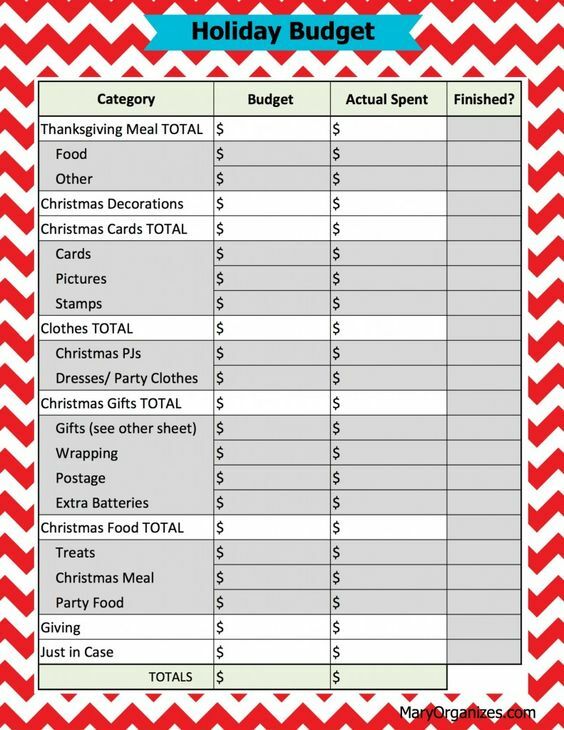 Anything we do seems IS expensive.... gift giving x 6, travel expenses x 6, grocery shopping x 6, eating out x 6, events x 6. 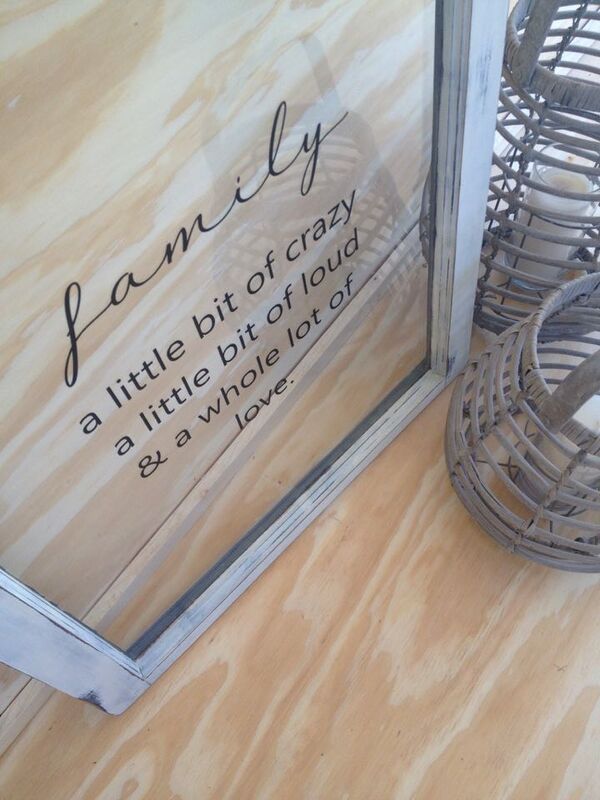 I love our big family but man are we expensive, I'm sure many of you can relate! So the more cash we have on hand for the holidays the less stressed I am and the more enjoyable the season is. Bring in a Secondary Income the Traditional way: Work! 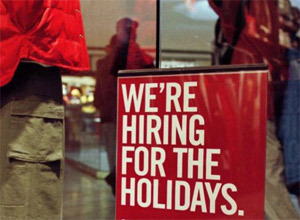 Lots of businesses look for seasonal workers during the Holiday season. This does require some scheduling that might not work for everyone's schedule especially if you have little kids that might need someone to care for them. There are also online options where you can earn a pay-check from the comfort of your home computer or smart phone. This option has been best for me personally because of my 4 kids. If you look for ways to earn an income online I encourage you to do your research. THIS (Click HERE) is a great article to help you navigate what you should be watching for as you move through this sector. Wishing you a day full of wellness! 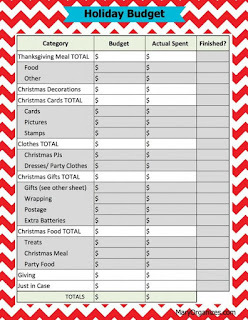 All this week we are talking about way's we can add some cash to our budgets for Christmas. One way you can make some cash is to provide a service for others. Think of out of the box ideas that would help relieve pressure or aid time to others. Things like putting up outside Christmas décor, wrapping gifts, sending out packages or Christmas cards, babysitting for Moms who need to do Christmas shopping etc. These tasks might not make you rich but it will help put cash in your pocket for the holidays. A bonus is many of these projects older kids can do as well to make some spending cash. 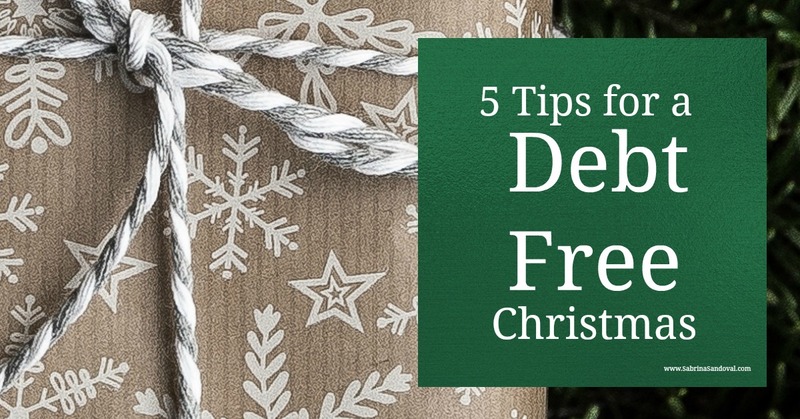 Follow us on Facebook to see more ideas and tips for a Debt Free Christmas! Can you believe Christmas is getting so close?! If you've been following me this past week I've been focusing on having a Debt Free Christmas. Most Americans spend well over $900 each year just in gift giving. That doesn't include travel expenses, extra food, events etc. From now through December 25th I'll be sharing ideas, tips, tools and DIY projects you can accomplish so you lead into 2018 without any Holiday debt. One of the way's we can detour away from using our credit cards is to have extra cash on hand to pay for those Holiday expenses. 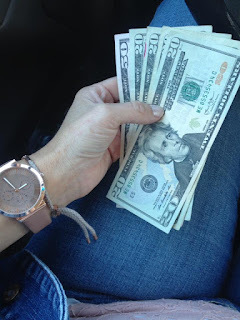 This week I'll be sharing 5 way's that you can make some Christmas cash. A simple way to make some cash and relatively quickly is to sell some things! Think about it, your kids have a room full of things that they have possibly outgrown, right!? 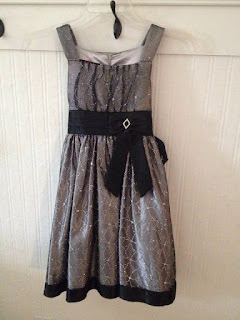 How about all of those Holiday dresses or little suits you buy for your kids each year. Go dig through their closets. Compile 5 - 10 pieces. Sell each dress for $10 and you'll easily make $50 - $100. Make sure it's clean, stain free and without tears. Pieces that are less than 5 years old will sell better due to trends and styles. When taking photos of your pieces your looking to sell make sure you take the photo in a clean spot in your home. Avoid having a lot going on in the background and make sure your photo is of good quality. Sell in your local area. I find Facebook for sale sites near our hometown are a great source to sell pieces so I can avoid shipping expenses and can hand deliver. If your looking for an attractive DIY project that's easy on the budget and simple for your kids to help with this would be it! Soothing, relaxing, toxin free jar of goodness! As the air starts getting colder our skin often gets dryer and dryer. 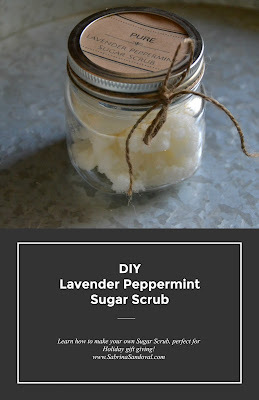 A sugar scrub helps to remove all of the dead skin leaving more room for moisture in your skin. Mix the Coconut Oil and Sugar together. Once it's combined you'll add your Essential Oils. (If your looking for some other seasonal blends click HERE). Then fill your jars with the sugar scrub! I printed off cute labels from Avery.com and used some simple bakers twine to finish our project. This gift is affordable, useful and good for the skin! 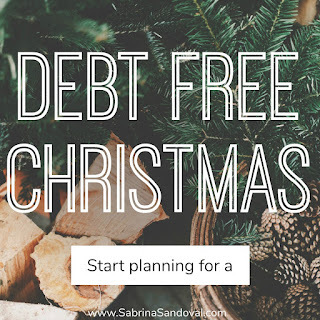 Start planning for a Debt Free Christmas! Christmas is 56 beautiful days away! 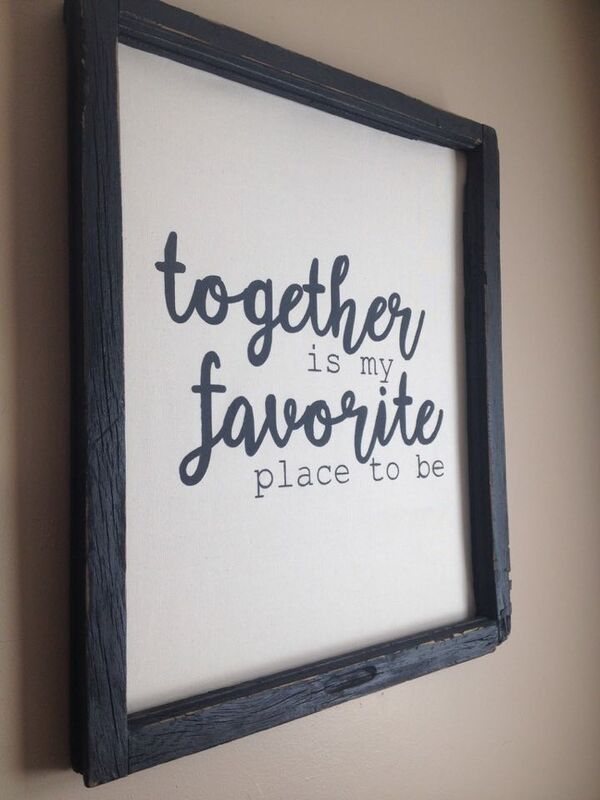 I love this season of thankfulness, giving, joy filled days and families coming together. What I don't love is the rush, the anxiety over gift giving and the enormous debt load we put on ourselves. This year I invite you to join my mission of living a debt free Christmas. 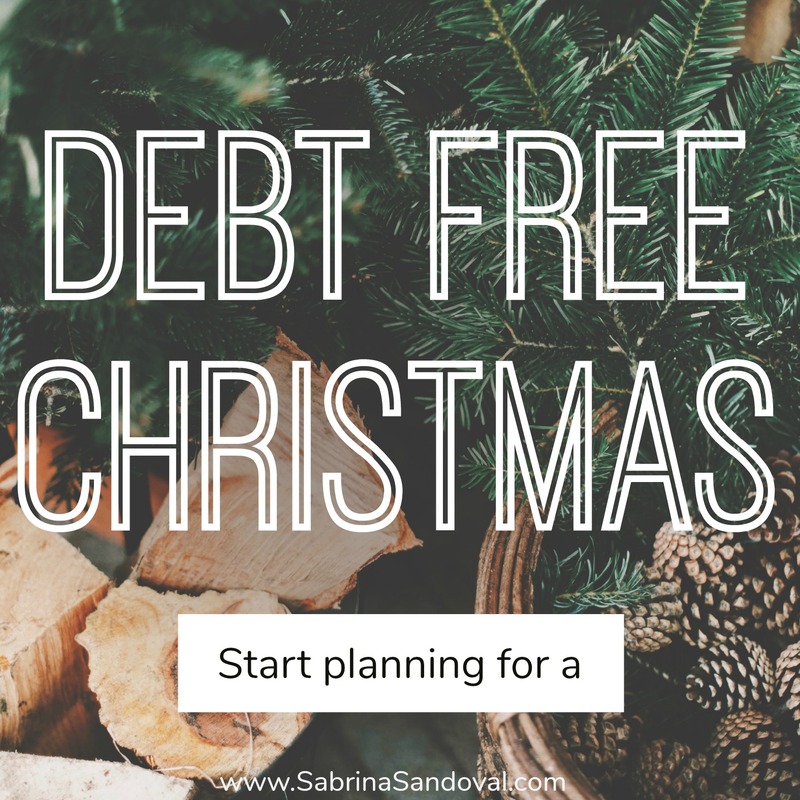 Starting November 1st I'll be sharing tips, ideas, DIY's and resources to help you to pay for Christmas in cash without the stress of debt! With all of the costume picking, pumpkin carving, Halloween parties and Trick or Treating it can be a bit exhausting. Here's a blend that will help you relax with this cozy, slightly spicy blend. Orange oil is known to promote good digestion to help with all of those Halloween treats your kiddos will be getting into along with its immune boosting properties to ward off sickness and germs. Lavender oil is very calming and relaxing to aid in helping your little Trick-or-Treaters to calm down and drift off to sleep after an evening of excitement. Frankincense is known to help with anxiety, promoting feelings of peace and love. I love this fact especially with little ones who might become fearful with scary Halloween costumes they might see. If your looking for a safe source to buy your oils from, check out THESE. They are 100% PURE and budget friendly. "Help me to create a peaceful, restful, safe, welcoming home." 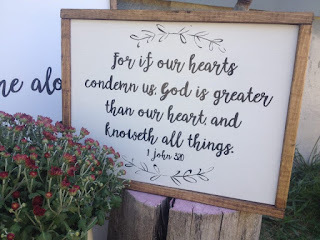 As my husband, children and guests come in and out of our home I want them to feel all of these things and there are simple things that I do to help to encourage this kind of home environment. 1. A tidy home is more than having the dishes done and the floor vacuumed. 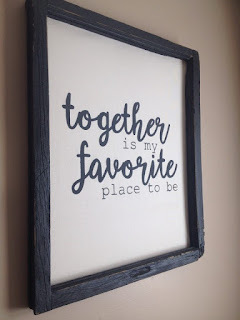 Its the process of having things in their place and clean - so when others, in particular my family, come into our home they feel like they can find a place to sit and just be. 2. Smell good! A home that smells good is so inviting to me. This might be a seasonal scent, one of my favorite essential oil combos in the diffuser or cookies in the oven - either way the aroma of my home makes me feel different ways. 3. Front door Love. Having something pretty at the entrance of our home is one of my favorites! I want everyone that enters our doors to feel welcomed and thought of. I feel like that starts at the entrance. 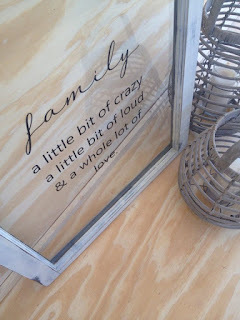 There are simple things you can add like a wreath, chalkboard sign or vinyl "Welcome" that really give an extra touch. 4. Eat! Our senses play such a roll in how we react and fee. One of those senses is that of taste. I keep quick and easy treats close by that I can have out in minuets if a guest pops by. Candy corn this time of year is in my cupboard and I often bake bread and have it sitting close by to cut and have out. 5. You! Some of the most welcoming experiences are those that when I pull up to someones door they meet me with a smile and a warm hug that makes me feel at peace and like I'm supposed to be there. Blessings my friends! May you be able to bless those who enter into your home. They may be your children, spouse, friends, family or those you are just now meeting - but may they be welcomed and feel loved as they enter your doors! October Essential Oil Blend & Why You should use it! Essential Oils have become such a welcomed part to our days. Each season brings different favorite blends for us and for the month of October this Farmers' Market Blend hits the spot! Why use this Blend in the Fall? During the Fall season we loose sunlight and our days become shorter, the temperatures drop, sickness begins to go around and many find they are feeling a bit down both mentally and physically. 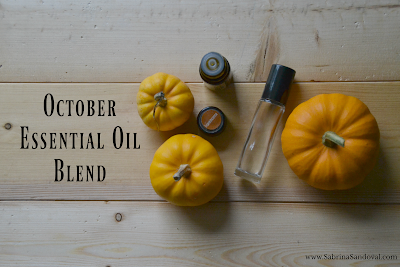 The benefits to this blend are perfect for the season! The Orange oil is very uplifting, immunity booster, that is calming. The Clove oil is a warm, woody scent this also promotes a healthy immune system and to ward off free radicals that cause sickness. Frankincense oil has an earthy scent that also promotes personal wellness and helps to relieve stress and depression. If your looking for a source to purchase oils try HERE. There 100% PURE and shipped directly from the manufacturer to your doorstep. I know you'll love them! I've been creating some beautiful pieces lately! 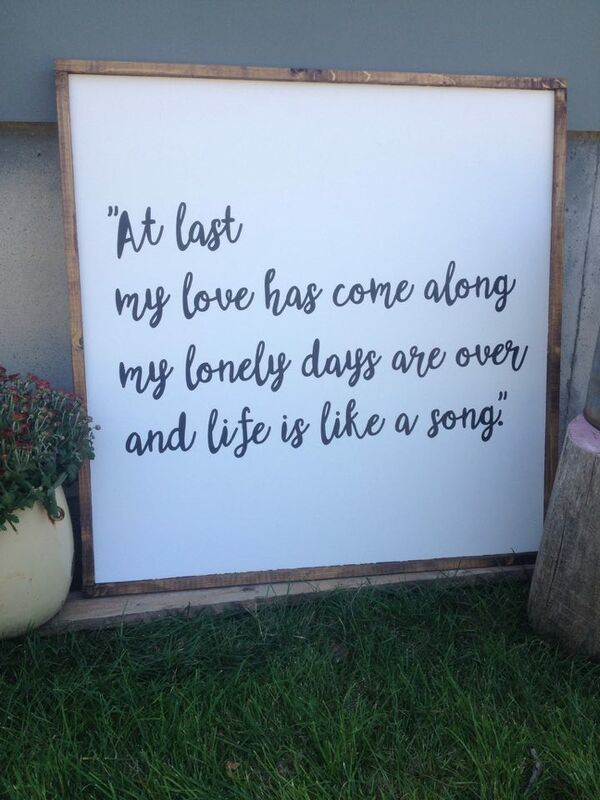 Most of these are custom pieces made specifically for clients who want a way to share words that have a strong meaning to those they love. Each time I create a piece like one of these I pray over the project and the homes they will be hung in. As I look over each of these I find one thing in common, love. 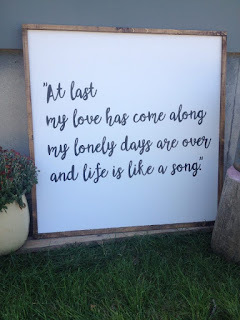 The love in an anniversary gift, the love for a friend who has experienced loss, the love in inviting others in to "STAY awhile" and the love of family! 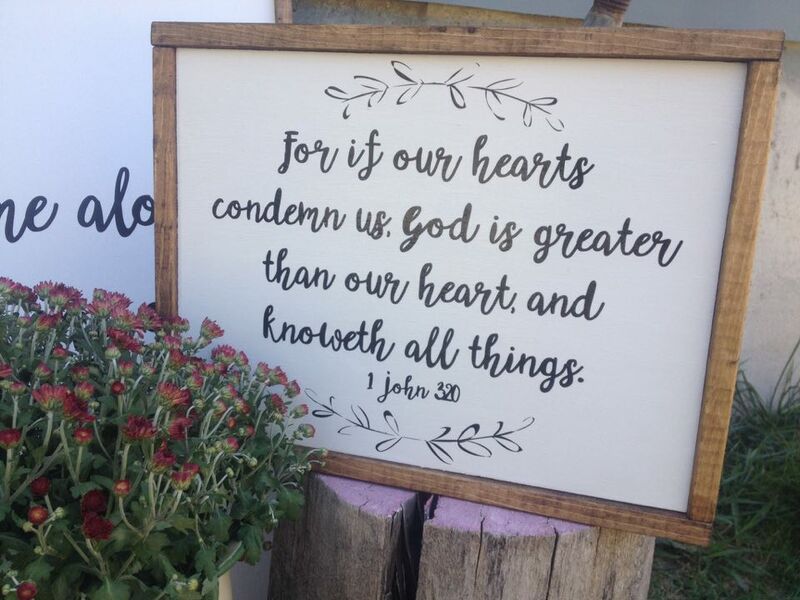 May you be blessed as you lead through this day and feel loved!